and many, many other electronics. When TVs arrive at our depots we have a special procedure we take when receiving and preparing them to be sent to processing plants in the B.C. interior because believe it or not, TVs are toxic. Despite international laws designed to prevent this, many developed countries send e-waste overseas to Asia and Africa. Inspections of 18 European seaports in 2005 found as much as 47 % of waste destined for export, including e-waste, was illegal. It is important that you know that when you recycle your electronic waste at Island Return It, we never send product overseas for dismantling. We use only approved facilities in North America. 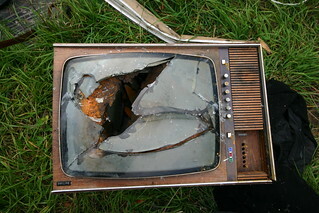 In particular, older TVs with CRTs (cathode ray tubes) need to be handled with care as they contain lead dust that is harmful when exposed to skin or is inhaled. If a TV’s outer container is broken you need to be mindful of the highly toxic lead dust in the air. Lead dust doesn’t settle the same way regular dust particles settle, it hovers and the slightest breeze will send it all over the place! Glass shards are another hazard to be aware of here. When TVs break in the depot we evacuate the area until the dust has had a chance to settle, then we suit up for clean up. Employees are required to wear protective eye wear, steel toed boots, puncture resistant gloves and long sleeves/pants under a protective full body suit. We also wear respirators while mopping up this sort of accident. We use cleaning supplies to dampen the broken equipment and help keep the dust down and sticky tape to pick up hard to catch shards of glass. Once all the broken pieces have been removed and safely packaged in a seal-able box, we mop down the area to prevent residual lead or cadmium particles from becoming airborne. Cleaning up a broken TV is a bit of an ordeal which is why we often ask you to use a cart when transporting one from your car or truck to our counter inside. You might be the strongest TV carrier ever, but all it takes is one trip to send that TV flying so please, ask a staff member for help – that’s what we’re here for!